Communicate with each child in a way that is age appropriate so they understand. Explain what we are going to do and ask the younger child to be my “big helper”. If there is going to be discomfort or pain, I am honest and tell the child ahead of time. I believe that children are OK with “ouchies” as young kids get hurt all the time. What kids are not OK with is an “ouchie” without warning or being told, “this won’t hurt!” when it does...because that means I’m lying to them, which makes me untrustworthy. Brush twice each day – The AAPD recommends a pea-sized or less amount of ADA approved (non-fluoridated) toothpaste for children under two years old, and the same amount of an ADA approved (fluoridated) toothpaste for children over this age. The toothbrush should be soft-bristled and appropriate for infants. Start flossing – Flossing an infant’s teeth can be difficult but the process should begin when two adjacent teeth emerge. Dahm Dental will happily demonstrate good flossing techniques. Visit the dentist – Dahm Dental monitors oral development, provides professional cleanings, applies topical fluoride to the teeth, and coats molars with sealants. Biannual trips to the dental office can help to prevent a wide range of painful conditions later. Ask us to review your child’s fluoride levels. For most infants, the sucking of thumbs and pacifiers seems to be a happy, everyday part of life. However, these habits have very harmful effects on the growth of your child's face and cause improper jaw and bite development when continued past 6 - 12 months from birth. According to research from the American Academy of Pediatric Dentistry (AAPD), pacifiers should be discontinued by the age of 12 months to avoid the complications which we see all to often. 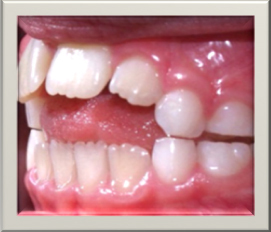 This picture is an example of what can happen to the teeth with thumb sucking. Pediatric oral care has two main components: preventative care at our office and preventative care at home. Though infant and toddler caries (cavities) and tooth decay have become increasingly prevalent in recent years, a good dental strategy will eradicate the risk of both. The dentist examines the teeth for signs of early decay, monitors orthodontic concerns, tracks jaw and tooth development, and provides a good resource for parents. In addition, we have several tools at hand to further reduce the child’s risk for dental problems, such as topical fluoride and dental sealants. Oral habits – Pacifier use and thumb sucking may cease over time, but both can cause the teeth to misalign. Stopping these harmful habits as early as possible can prevent severe consequences to the proper development of your child's face and bite. The dentist can suggest a strategy (or provide a dental appliance) for thumb sucking cessation. Avoid threatening language – Dentists and staff are trained to avoid the use of threatening language like “drills,” “needles,” “injections,” and “bleeding.” It is imperative for parents to use positive language when speaking about dental treatment with their child. The dentist and dental hygienist will address parental questions and concerns. Due to too much sugar in our diets, tooth decay has become increasingly prevalent in preschoolers. Not only is tooth decay unpleasant and painful, it can also lead to more serious problems like premature tooth loss and childhood periodontal disease.